On March 5th 2013 at 6:30 p.m., the Madison Common Council will vote on whether or not to make changes to Sherman Avenue. Proposed changes include a plan to slow down car traffic and make bicycling and walking safer on North Sherman Ave. These recommendations are the result of a long-term, community-driven effort to improve conditions for bicyclists and pedestrians in the neighborhood. First, North Sherman Avenue will become a 3-lane street from Trailsway to Fordem Avenue, consisting of a lane of traffic in each direction and a two-way left turn lane in the center. This change will make room for bikes lanes in addition to pedestrian refuge islands at five locations along the project corridor. These changes will greatly improve conditions for the countless pedestrians and bicyclists who live and travel in this area. Currently, bicyclists and pedestrians have to share the sidewalk as there is no safe place to travel by bike. A comprehensive engineering report showed Under existing conditions, people choose to either: ride their bikes in the street with traffic, ride on the sidewalk, avoid N Sherman Ave altogether or not bicycle at all. According to counts conducted by Alta Planning and Design in 2011, there are estimated to be 447 bike trips and 321 pedestrian trips per day on N Sherman Ave between Fordem Ave and Trailsway, and 52% of the bicycle trips are made on the sidewalk. Many riders who use the street expressed that they feel unsafe and have had negative experiences with motorists. Bicycling on the sidewalk, while legally permitted where buildings do not directly abut the sidewalk, can be problematic for pedestrians as the shared space is too narrow for multimodal use. 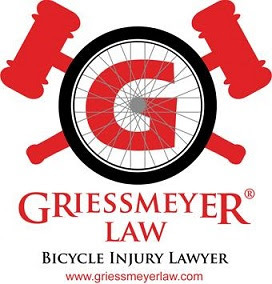 Bicycling on sidewalks is also less safe for bicyclists, as drivers turning onto and off of N Sherman Ave at intersections and driveways typically do not look for bicyclists approaching on the sidewalk. The safest solution for these problems is dedicated bicycle facilities. 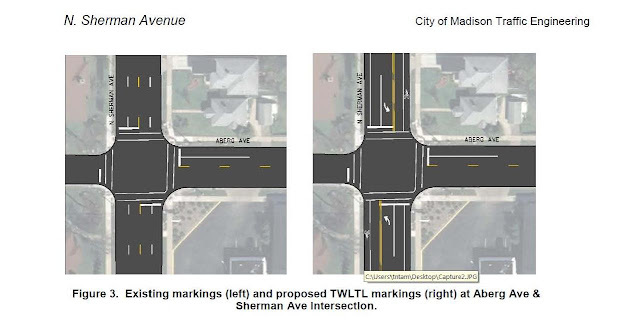 Converting the street to a street with a TWLTL will allow for four foot wide bike lanes outside of the gutter section—the City of Madison standard width for bike lanes, which is shown in Figure 5.